I'm sorry, but learning routing, IP networking standards, and how to deal with wifi devices is just going to be a right-of-passage for children of this coming generation . . . just like when kids had to learn how to milk a cow by hand and fix an internal combustion engine back in the hazy days of the mid-20th century. My shop cam page can be found here. 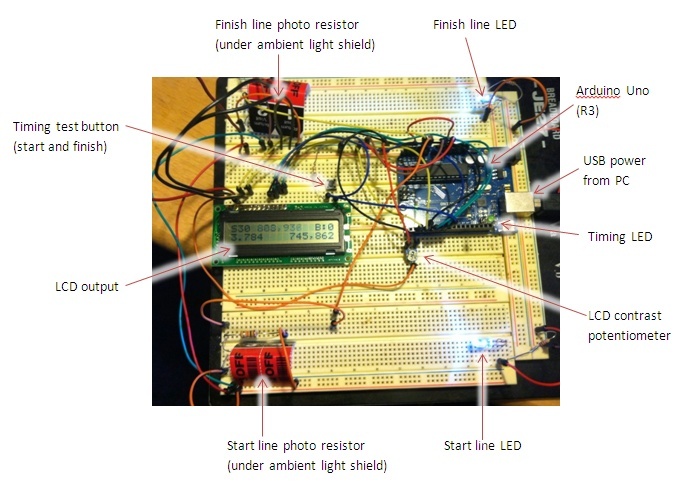 I just happened to be on Google+ today when a posting came across the wire about Massimo Banzi's recent blog post on the Arduino blog. Massimo Banzi is, as most people know, one of the five founders of the Arduino open-source hardware movement. I first learned about the Arduino board by listening to a FLOSS Weekly episode in which he was interviewed. I truly believe he really is a believer in open source and the democratization of technology. So it's sad to hear that the core of the Arduino world is in the midst of a civil war. It seems that one of the other five founding members, Gianluca Martino, has gone and run off with a key Arduino trademark and started claiming the name through his company. Although sad, it doesn't strike me as very surprising. Any time humans attempt to create a truly altruistic community, there are times when some of the baser instincts of human nature show up and start mucking things up. Now, reading his blog post, and a longer article on Make that details the history of the conflict, my immediate reaction was, "Well, that's clear. It's obvious who's in the wrong." I was hopeful that it would be cleared up quickly. But reading the comments under the Make article, which was posted over 24 hours ago, I should have known better. Some, possibly trolls for the other side, immediately skewered the article and Mr. Banzi as one-sided and unfair. Possibly. I agree that it is important to hear the other side of the argument. I had to get the Arduino timer mounted on the track so Liam can run some tests for his science expo before this weekend. Wednesday, I drilled holes in the sides of the track at 25cm from the top and 30cm from the bottom to mount the 'light beam' LEDs on the right side and the photoresistor sensors on the left side (as you look from the top of the track to the bottom.) Used hot glue to position the LEDs in the holes. Then I powered the LEDs so I could see exactly where the beam of light hit the opposite rail. That's when I drilled the holes for the sensors. Then I hot glued the sensors in place. I'm getting approximately 1.036 seconds for it to run with no extra weight, plus or minus about 0.006 seconds. I repeated the run about 15 times and got readings from around 1.029 to 1.042 seconds. Not too shabby. February 19, 2014 - OK, I first posted on this project a couple of days ago. I've got a short window to get this working. Liam's science expo is on March 7th, and I need to complete the track (with attached timer) in time so Liam and I can run a set of experiments. So late last night, I managed to finish the prototype of the Arduino timer I plan to mount to the side of the test track. It's all breadboarded now, and I'll probably just use the prototype to run the timing for Liam. After we get some results on paper, I'll worry about turning this into a sturdy version permanently attached to the side of the track. The hardware work was basically done last week. I just needed to figure out the update to the sketch to figure out how to trigger the timing code using the inputs from the two photo-resistor sensors. The picture here shows the prototype board, as it's currently working. Click the image to enlarge it. My son Liam is doing a Science expo project. It's sort of like a science fair, but in second grade they don't do judging. It's just a demonstration, and he'll get a participation ribbon. I don't really care about that, I just want him to start learning the scientific method. Hot frying pan in an auditorium filled with 7 year olds. Not going to happen. I kind of steared him to do something related to our last project, which was the pinewood derby car he and I built for the Cub Scouts.